More than a week after a deadly earthquake and tsunami laid waste to parts of the Indonesian city of Palu, international aid has begun arriving. And power has been restored. The death toll now exceeds 1,700. An excavation of the dead has been slow, especially in areas where the quake swallowed houses whole. NPR's Julie McCarthy is there. And she has this report. JULIE MCCARTHY, BYLINE: Walking here feels like stepping in quicksand. This is the neighborhood Petobo, built on reclaimed swamp land, and one of the worst-hit areas of the quake. There's the powerful smell of dead bodies beneath us. Residents describe being shaken horizontally, then vertically, and then gyrated as if in a blender. Survivor Muhlis Ipul sits sadly among the ruined houses on a plastic chair stuck in the soft, porous Earth. MUHLIS IPUL: (Foreign language spoken). 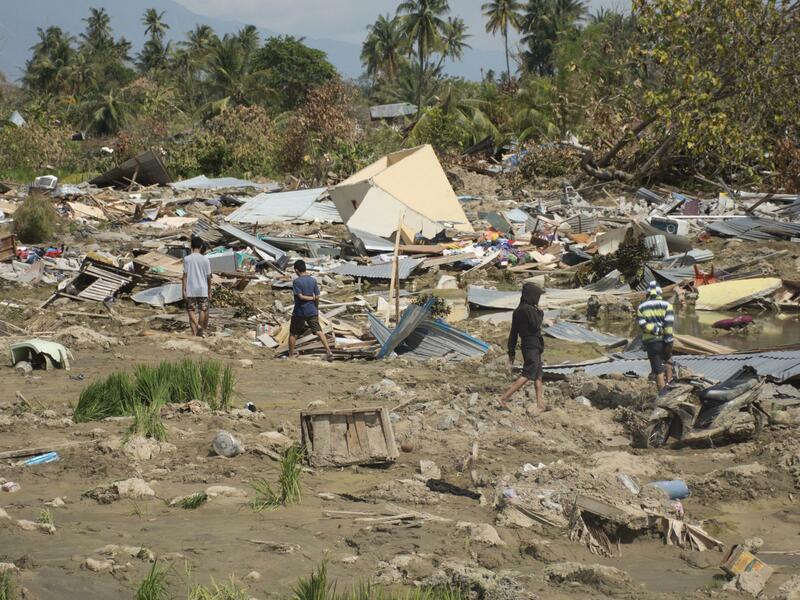 MCCARTHY: Ipul says the earthquake churned the soil, uprooting homes. It's a phenomenon known as liquefaction. Ipul says you can no longer see the houses. And he says there are thousands of victims here. 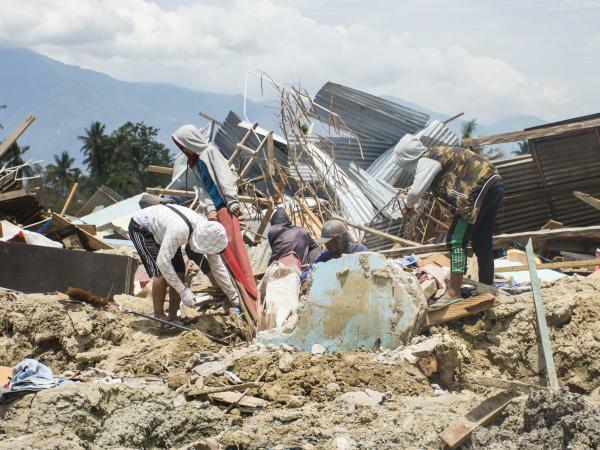 Residents estimate that some 7,000 people lived in this affected area of Petobo, and most could be entombed here. Ipul's wife and two young daughters had just showered when violent shaking engulfed their small house. They all ran out the front door together. MCCARTHY: "The asphalt broke up under my feet. I fell, got trapped in the cracks, and lost hold of my 5-year-old girl. 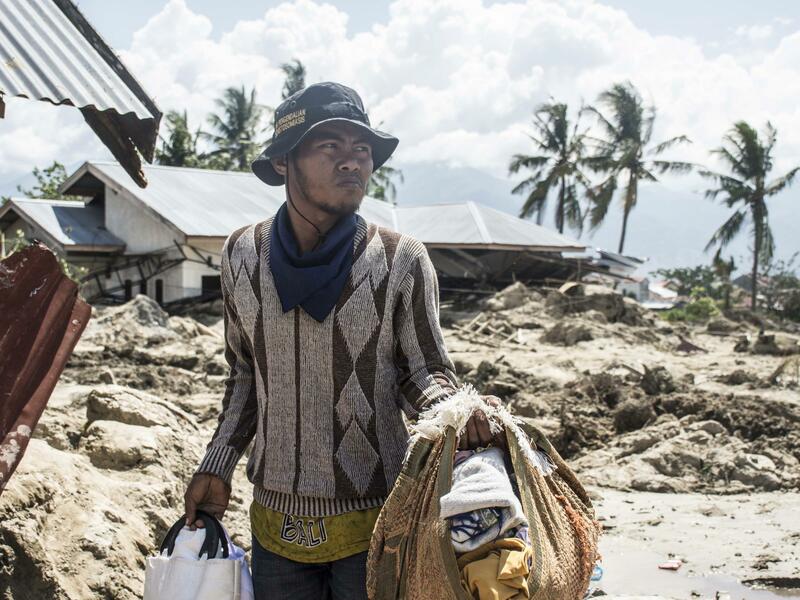 The last time I saw my wife and children, they were covered in earth," Ipul says. And he believes they were carried several hundred yards to a coconut grove that he's pointing to. Ipul heard people screaming for help as he lay in the darkness, stuck. Suddenly, mud exploded beneath him. And he was dislodged. MCCARTHY: "God gave me a miracle," he says. "The rushing mud opened a way out. I saw a cable, tucked it under my arm, and the mudflow pulled me along." Ipul was deposited on a small rise, where he sat and listened for the cries of his wife and daughters that never came. MCCARTHY: Ipul guides us to the remains of his house. A window framed in green paint peeks out from mounds of mud and debris. 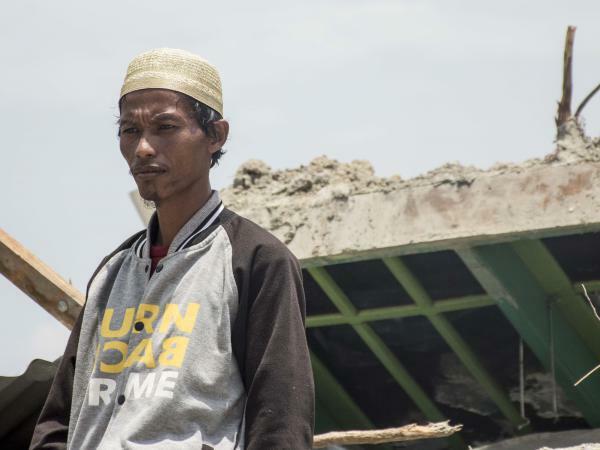 Ipul, a construction worker, stacks metal sheeting ripped loose from his home, collecting it to rebuild somewhere else - a life-affirming idea. But at 32, Ipul looks 52. Such is the strain of the disaster on him. Speaking through an interpreter, he says his most painful memory is his child slipping through his grasp and says with resignation, there is no use in getting angry. It was an act of God. IPUL: (Through interpreter) I feel really sad - all of us here, the people in Petobo, not just me. And we all feel great loss. MCCARTHY: Ipul waits day after day for someone to retrieve the bodies of his family. He may wait in vain. The corpses that have been found have been dug up by hand. 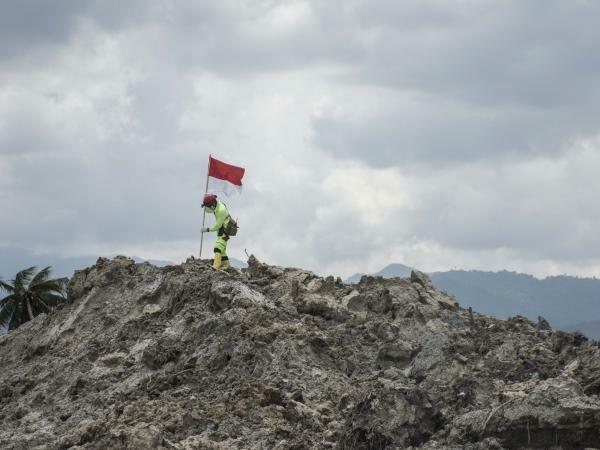 But heavy digging equipment is needed to approach the magnitude of the task that Petobo presents. And the precarious terrain makes it risky to excavate. The government says it is considering instead turning this onetime swamp land into a mass grave. Julie McCarthy, NPR News, Palu, Indonesia. Transcript provided by NPR, Copyright NPR.